Music in Japanese: "Enjoyment" of "Sounds"
Two names ring out as giants in the field of sound and music research. They are Hans Jenny and Masaru Emoto. Both used inanimate objects to discover how sound impacts their physical makeup. Hans Jenny used sand and milk. 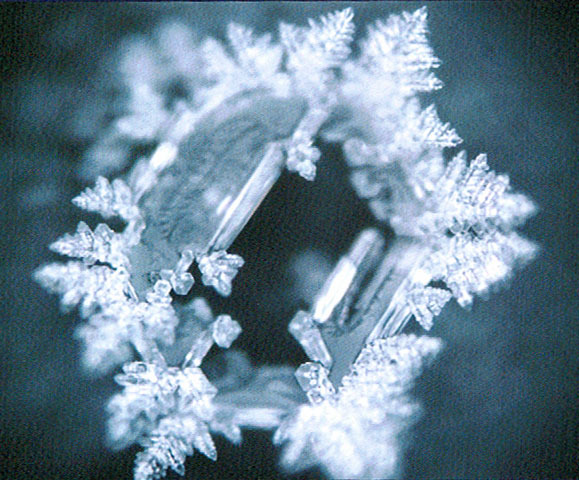 Masaru Emoto uses ice crystals. Few, if any, have equaled Emoto-san's scientific method for showing how rythyms affect water, ice and since we are about 70% waterus. The classical music collected for this book ( on a two CD set) created beautiful ice crystals indicating profund opportunities for healing. 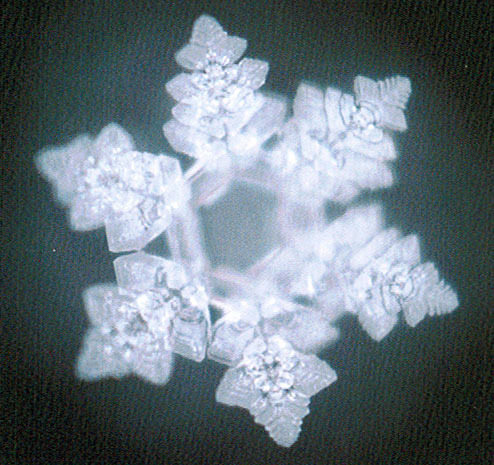 Mr. Emoto sees energy as vibrations moving through matter. These frequences are unique to various forms of matter, including organs and diseases. They are called hado which translates as "wave motion" or "vibration." Looking at the pictures of ice crystals while listening to the corresponding music can fascillitate healing by assisting the mind to atune with the vibration. ... I have collected these pieces of classical music, which my research has shown to produce beautiful crystals that suggest healing and well-being. I'd like to describe the process of this research. We start with the premise that water has an ability to memorize various kinds of information. Because music is an assemblage of vibrations, it can be said that the difference in separate pieces of music is the difference in vibration. Water-crystal photography is a technique that can express the quality of each piece of music with a visual image. 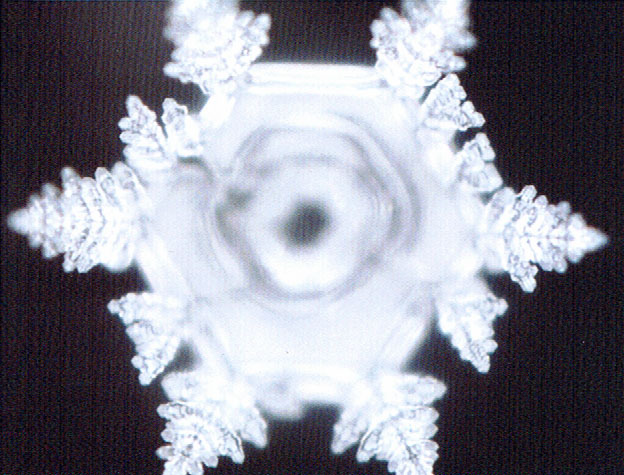 The water-crystal photographs in this collection of music were taken after each piece of music contained in the CD was played to distilled water. Here is a brief explanation of how we do this. 1. First, we play each piece of music with a set of speakers to the vial filled with distilled water. 2. We place about 1 ml of the water sample onto each petri dish. We do this with fifty dishes for each water sample. 3. We freeze the water contained in the fifty petri dishes at a temperature of -25 to -30 degrees centigrade. 4. Illuminating the frozen ice on each petri dish under a light microscope, we observe each water crystal and take sequence photographs with a magnification of 100X to 200X. These observations and photographs are made inside a large, cold room at -5 degrees centigrade. It is the tip of the frozen and expanded ice that produces a water crystal. The ice block that is taken out of the freezer melts gradually because of the temperature difference and the light from the microscope. At this moment, the water crystal at the tip of the ice block shows the expression of water that has resonated with each beautiful piece of music. The technique of water-crystal photography can capture this moment as a picture. We continue to take beautiful images that complement each selection of excellent music we test. But that is not all. The next step is to measure the hado contained in a water-crystal photograph. Let me explain how I came to measure the hado of photographs. For over fifteen years, I have successfully used a hado-measuring device, called a Magnetic Resonance Analyzer (MRA), to measure the characteristics of hado and adjust the balance of the human energy field. To do a hado measurement on a person, the client places his or her palm on the MRA's measuring plate. I have found that if the client cannot be there in person, a photograph of the client works equally well in getting a hado measurement. Once the hado has been assessed, we can transfer to water a hado that counteracts any negative hado generated with the MRA. This is possible because water can memorize hado, which is vibration. The client-then drinks the hado water, which corrects the disturbance in his or her energy balance, activates immunity, and facilitates self-healing power. Now, let's return to music. When we began to measure the hado of a piece of music, we found it difficult to do so directly, because music has no visible form. 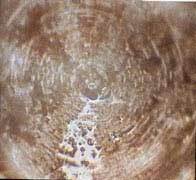 However, it became possible to measure the hado of music by measuring the hado of the water-crystal photographs of water that was exposed to the piece of music. 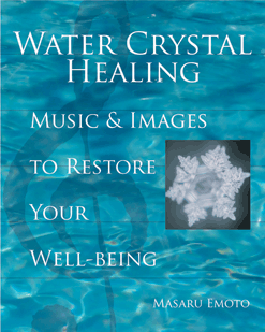 By combining the water-crystal photography and hado-measuring techniques, the healing effects of music become very clear and concrete. 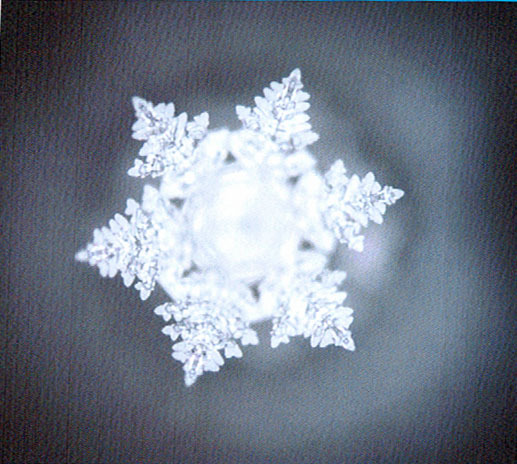 My associates and I exposed water to pieces of music, observed the resulting water crystals, and took photographs. At the same time, we measured characteristics of the hado of each photograph with the MRA. Based on the hado data, we could infer the potential healing effects of each piece of music in terms of its hado effect. The YouTube video below left will give you an idea of the experience. Of course the quality of sound on the CD and the size of the ice crystal pictures in the book makes for a more pleasurable and healing experience. Plus, as I looked at this video again, I realized that most if not all of the crystals are not from The New World Symphony. So the true out-picturing of the hado is not there. The video on the right is about how words and thoughts impact matter. By the way, all classical music is not the same. Dr. John Diamond found through muscle testing that some conductors allow more positive energy (Light or hado) through their efforts. This is because they are at a nexus between the musicians, the microphones and the audience. He picked Wilhelm Furtwängler as one of the best. I think he didn't want to create controversies so he didn't pick modern day conductors. But I will pick a few. You can't go wrong with George Szell or Sir Georg Solti. There are a few who were technical masters but lacked a certain joie de vivre. Two who were famous contemporaries, one in NY and the other in Germany, I might put in that category. Here is a sampling of four pieces selected for Water Crystal Healing. The text comes from the book as well. "The Moldau" contains hado that can cancel the hado of irritability. At the same time, it resonates with and thus enhances the hado of the lymphatic system. Based on these results, my research suggests that by listening to this piece of music, you can alleviate irritability and vitalize lymphatic tissues in the body. When you feel irritable, your body is giving you a sign that you need calmness and peace of mind. By treating yourself more tenderly, your mind will become clearer. Emotional hado: calmness, peace of mind, relief from irritability. Listen to The Moldau while you meditate on this crystal. While you are listening to "The Blue Danube," your central nervous system, which may have withered due to habitual constraint, will be revitalized. Your heart will open and your body will feel relaxed. If you have acquired a habit of living in the fast track with a high activity level, your cells are calling out, "You don't need to suffer any longer. Live freely." Emotional hado: revitalization after fatigue and stress. Physical hado: central nervous system. Those who have forgotten the magnificence of themselves often resonate with the hado of self-pity. Respect yourself more. Let us remind ourselves that we are precious beings. Your biggest fan should be yourself. By listening to Lohengrin, you will restore self-love. By loving yourself, joint pain will also be alleviated. "The Trevi Fountain at Noon"
"How unlucky I am!" When you get depressed about your lot in life, listen to "The Trevi Fountain at Noon" and ignite a light in your heart. Say to yourself, "I can surely become happy." You will have such thoughts more and more. Imagining a bright future will raise the hado of your immunity dramatically. 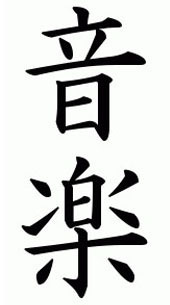 Emotional hado: good fortune and optimism. The book lists for $29.95. I picked it up at Powell's Book Store in Portland for $19.95. The prices below are very good considering it comes with two CDs. If you buy it used, make sure the CDs are there. As a frame of reference, here is a picture that resulted in the playing of heavy metal music from Emoto-san's previous work. Why this occurs I've explained in a past article called: Why 'Good Vibrations' may be Bad.